A Boston health inspector yesterday ordered Beantown Pho and Grill, 272 Newbury St., closed until it gets a plumber in to restore its hot water. Read more. 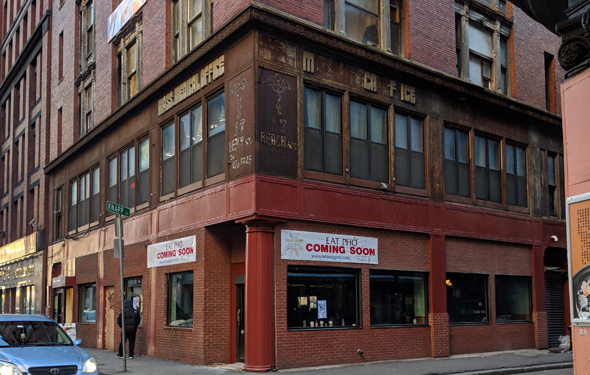 The Boston Licensing Board today reinstated the food-serving license for Pho So 1, 223 Adams St. - and even let it stay open longer than before it was shut for letting patrons drink after its official closing time. Read more. The Boston Licensing Board today revoked Pho So 1's food-serving and beer-and-wine licenses after its fifth citation in seven months for staying open well past its licensed closing time of 10 p.m. Read more. The Boston Licensing Board this week will decide whether to revoke Pho So 1's liquor license - or possibly even shut the restaurant completely - because police keep finding it open and serving beer way after its licensed 10 p.m. closing time. Read more. The Boston Licensing Board yesterday slapped Pho So 1, 223 Adams St., with a three-day suspension for staying open way past its 10 p.m. closing time on two days in August and September. Read more. The Boston Licensing Board decides Thursday whether to punish Pho So 1, 223 Adams St., for repeatedly staying open past its 10 p.m. closing time. The board today heard details of police citations for incidents on Aug. 29 and Sept. 2. That's in addition to a similar incident in May and yet another incident on Sept. 16. Manager Frank Schillace said the previous "Chipotle-like" format, in which customers would order, cafeteria style, then find a seat, proved to be a money loser - $20,000 to $30,000 a month, he told the board at a hearing today. Read more. The Boston Licensing Board yesterday ordered license suspensions for two Vietnamese restaurants where police found customers with beer in tea cups, because neither place has a license to serve beer. Read more. Two Vietnamese restaurants on Dorchester Avenue that don't have liquor licenses face possible sanctions after police found patrons drinking beer out of tea cups last month. Tomorrow, meanwhile, the City Council could vote on a proposal by Councilors Michelle Wu and Steve Murphy to let small restaurants in neighborhoods such as Dorchester legally let their customers bring in their own beer and wine. BYOB is currently illegal in Boston. Read more. Max Falkowitz journeys up from Queens in pursuit of the perfect bowl of pho on Dorchester "Boulevard:"
For the second time in three months, Nhung Nguyen went before the Boston Licensing Board for permission to reopen her VN Express Cafe at 1616 Dot. Ave. This time, however, she appeared without her husband, Khanh, who was the reason the board rejected her application to serve food in August, citing both illegal gambling at the Chinese restaurant that used to be there - when Khanh Nguyen worked there - and his inability to completely own up to a criminal past that included a conviction on gun charges in the early 1990s. In an unusual move, the Boston Licensing Board today rejected a couple's request to let them turn an old Chinese restaurant into a new Vietnamese place, because of the husband's criminal past and his failure to fully own up to it at a board hearing this week. The board rarely turns down applications for simple food-serving licenses, such as the one sought for the proposed VN Express, which would have replaced China Pagoda at 1616 Dorchester Ave. in Fields Corner. Boston Restaurant Talk reports on the planned August opening of a new Vietnamese place on Mass. Ave. called Pho Kup. Police say it wasn't the fact that a doorman at Cafe 1221 on Dorchester Avenue had an apparently drunken, angry patron restrained on the sidewalk that bothered them. It was, they say, the blood pouring out of several gashes on his face and head, which suggested to them that more than simple restraint had been applied to the man on the night of Nov. 24. The Boston Licensing Board decides Thursday what action, if any, to take over the incident, which restaurant managers say started when a regular customer, who had been in the restaurant for 90 minutes to 2 hours, got up to go outside for a smoke break. Jamaica Plain News reports on a possible tenant for the former Ban Chiang, which recently closed. Van B. Tang goes before the Boston Licensing Board next week for permission to open a Vietnamese sandwich shop in a stretch of Centre Street that has become a culinary mecca for the neighborhood. Tang's proposed Banh Mi Ngon would open at 1759 Centre St., next to Christo's and down the street from Thai Spice, Los Amigos, Red-Eyed Pig, Himalayan Bistro, West on Centre and the Upper Crust. Banh Mi Ngon would be open 10 a.m. to 8 p.m., according to its license request. The board's hearings start at 10 a.m. on Wednesday in its eighth-floor hearing room at City Hall. Turkey subs getting just a tad too boring? All together the sandwich presented me with a unique flavor and texture combination. The amount of veggies on this thing was intense but adding that to the bologna-y jello-y texture of the headcheese and you've got something interesting going on in your mouth. David explains why there's a reason they don't call it Tofu Pasteur.